One of the more powerful features within the GoSignMeUp system is the ability to create Custom Course Completion certificates. 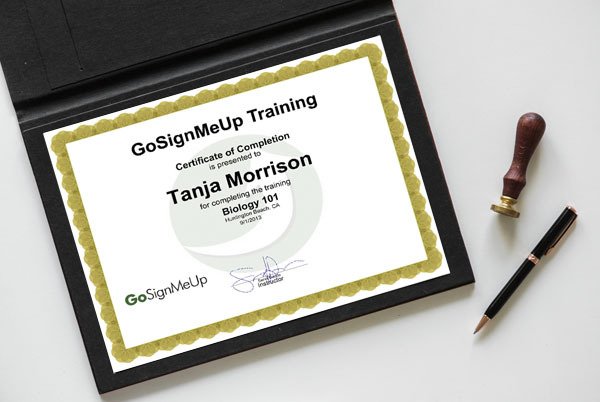 This one of the many tools for professional development and certification contained withing GoSignMeUp – The system can be set up to automatically email a completion certificate to students when they finish training, closing the certification loop! The design of the certificate is totally customizable using the Custom Certificate Maker tool – everything from the background decoration to the auto-populated fields are in your control. You can even set up the system to draw from a data-base of electronic signature image files to automatically fill out all the fields, so your certificates will be signed by the appropriate people. These certificates can be set up to print locally, or automatically email them to students who finish the course criteria! The Custom Certificate Maker from GoSignMeUp allows you to quickly and easily create your own custom certificates! Now you can see exactly how your certificate will look, while you are making it! Simply choose which fields you want to display on your certificate, then drag and drop them in to place. Its easy! Upload a pre-made background, or customize one with your company or event logo. Once your custom certificate is in GoSignMeUp, you can program the system to fill-out and email them automatically to students who meet your completion criteria. With GoSignMeUp and the Custom Certificate Maker, you can automate the entire certification process! GoSignMeUp is designed to help facilitate staff training and certification as part of a winning professional development strategy. GoSignMeUp’s online class registration software lets you focus on the course content, not the course paperwork! Automate the certification process and take advantage of the custom course certificate tool in GoSignMeUp. How Do I Create a Custom Course Completion Certificate? How do I Print or Email a Course Completion Certificate? How Do I Send out a Certificate to Students Who have Completed a Blackboard Course?